The dentists at AmeriDENTAL of Upper Darby are highly experienced professionals in all forms of tooth extraction and removal. There are many reasons that you may need to have your teeth extracted, some more urgent than others. This page will inform you on what tooth extraction is, why the procedure is performed, and the common causes for tooth removal. Third molars, or wisdom teeth, are extracted either before or after they come in. They most often come in during the late teens or early 20s. They must be removed if they are decayed or diseased, cause pain, or have an infection or cyst. These teeth can get stuck in the jaw, or “impacted,” and do not come in. This irritates the gum, causing pain and swelling, and the tooth must be removed if this is the case. If all four wisdom teeth must be removed, they should be taken out at the same time, if possible. AmeriDENTAL provides wisdom teeth removal procedures as apart of our dental extraction services. A very common procedure, our dentists are highly skilled at removing wisdom teeth with minimal impact to the patient’s comfort. Our goal is for you to heal as quickly, painlessly, and efficiently as possible. 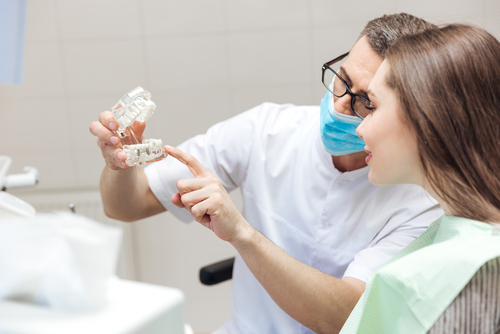 If your tooth has been damaged or broken by decay, our dentists will try to fix it by filling, applying a crown, or exploring other treatment possibilities prior to extracting the tooth. Sometimes, though, the tooth has been damaged beyond repair. In cases like these, the best choice of treatment is extraction. A tooth found to be very loose, even with bone replacement surgery (bone graft), may also require extraction if the dentist cannot save it. In some situations, people have extra teeth that block and prevent other teeth from coming in. Sometimes baby teeth stick around too long and prevent permanent teeth from coming in. People who require dental braces may need certain teeth removed in order to create room for the teeth that are being corrected. People who receive radiation to the neck and head may need to have teeth in the field of radiation extracted. Cancer drugs may weaken teeth to the point of infection. Some people taking cancer drugs will need to have infected teeth extracted. People with organ transplants have a high risk of tooth and gum infection because the drugs suppress the immune system. We truly care about you and your family’s dental health and hope you seek us out for your next tooth extraction or wisdom teeth removal service. Serving Springfield, Ardmore, and Upper Darby, PA, we look forward to seeing that bright and beautiful smile for years to come!